We ordered Gluten Free Meals on our flights to and from the States, by checking a box on their web site. It worked. We ordered Gluten Free on our last trip abroad, with Continental. It worked too. On BA, the meals served from Houston to London were about the same as the meals received on Continental, rice cakes for our ‘bread’ ,and subbed grapefruit in for dessert. Once we were flying with with a European Crew and European supplies. we received gluten free bread and fruit with a sauce. One the trip from Zambia to London they lost one of us, so there was only had 1 bread roll for the 2 of us at brunch, which actually worked fine, I had the top skinny and Keith had the bottom FAT and most of the butter. The main dish seems to always be the chicken with rice. ALWAYS. I glance at the other flyers meals and they look gluten free also, somthing beef stewish and steamed fish on rice, I wonder on the ingredients,. Maybe, just maybe they contain soy sauce, or wheat as a thickener in the gravy? I think, that they too may be gluten free, they just have not been labeled so. I am thinking my next change the world mission will be to add to or include gluten free meals into the mainstream of flight cuisine. 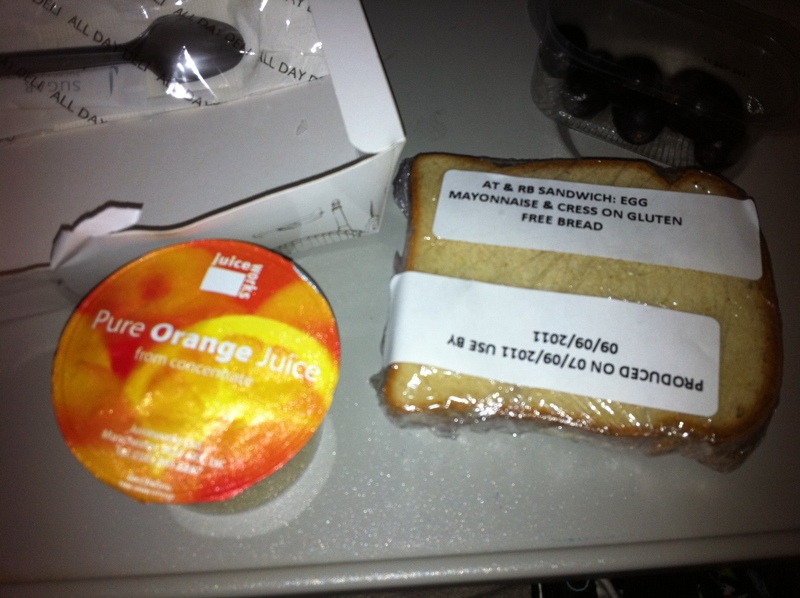 The ‘snack’ meal was the same on all flights, egg salad sandwich, with a lot of fresh dill and no mayonaisse on the bread. The bread was a great looking white bread, but like most GF bread it really needed the extra moisture of some sauce. The othe flyers received a ham or turkey and cheese crossiant, again we could have had the guts, if they only would think outside of the pre-packaged airline box. Keith and I are starting a mission into a vacation trek into other parts of the world. We will be in Zambia South Africa for a time and then we are stopping over in France for a bit! We will fly Continental with no meals to catch British Airways in big Hub and have Gluten Free meals, 6 over and 6 back. We will see how British does!!! The Zambia stay will probably not have much issue with GF eating, unless they try to Americanize for us and add pasta. France I am totally clueless about, I think I may be wanting of pastries and such. Aren’t the French suppose to be pastry people? It is an adventure and I will take you along!! Check in and see what we eat!! I can not promise the posting will be real consistent, seeing we do not know when we will have wi fi- But I know we will once we reach Paris- So for sure in about 10 days I can tell you about Zambia, if not sooner! !